Small-cell carcinoma is also called oat-cell carcinoma or small-cell lung cancer (if in lungs). It’s a type of highly malignant tumour, arising within the lung commonly. In lungs, small cell carcinoma makes up 15% of all lung cancers in the USA and occurs almost exclusively in smokers only. Heavy smokers commonly have more incidence of this cancer. However, the cancer is also found rarely in non-smokers. What is meant by cytopathology? Cytopathology is a diagnostic technique. In this process, we examine the cells taken from various sites in the body and determine nature or cause of the disease. Pap test is the first cytopathology test and is utilised for diagnosing and screening cervical cancer and its precursors for last 50 years. Small-cell carcinoma is composed of primitive appearing cells and is an undifferentiated neoplasm. As we can infer from the name, the cells of small-cell carcinomas are smaller in size than normal cells and thus they barely have any room for cell cytoplasm. Some researchers has identified this thing as a failure in the mechanisms inside the cell that control its size. 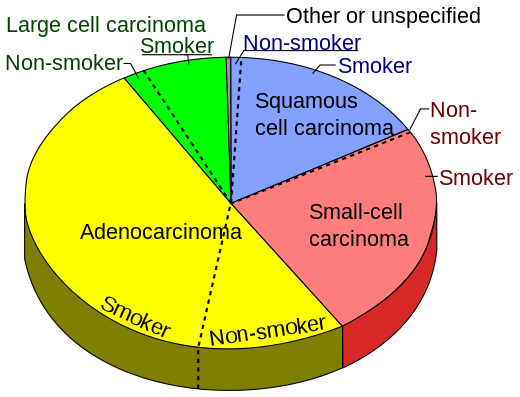 Incidence of small cell lung carcinoma as compared to other carcinoma of lung is more in smokers. Small-cell carcinomas have a high grade neuroendocrine nature. As a result, they can produce ectopic hormones like anti-diuretic hormone (ADH) and adrenocorticotropic hormone (ACTH). These ectopic hormone productions can result in various diseases and syndromes. E.g. ADH secretion through ectopic locations may lead to syndrome of inappropriate antidiuretic hormone hypersecretion (SIADH). A well known paraneoplastic condition linked with small-cell carcinoma is Lambert-Eaton myasthenic syndrome (LEMS). In small cell carcinoma associated with lungs, it’s sometimes also called “oat cell carcinoma”. This term is used because of the scanty cytoplasm in the cancerous cells and their flat shape. Small cell lung carcinoma is thought to originate in the bronchus from AUPD cells (neuroendocrine cells), also called Feyrter cells. As it originates from neuruendocrine cells, it expresses a variety of neuroendocrine markers and may result in paraneuplastic syndromes and cushing’s syndrome due to the ectopic production of hormones like ACTH & ADH. Small cell carcinoma of lung is found in almost 50% of the patients diagnosed with LEMS (lambert-eaton myasthenic syndrome. Small-cell carcinoma is staged differently than the non-small cell lung carcinoma as it metastasise more rapidly and widely. It leads to earlier involvement of mediastinal and hilar lymph nodes. Small-cell lung cancer may not occur alone and may occur in combination with various other histological variants of lung cancer. These variants include malignant tissue admixtures that are extremely complex. Smoking is a major and significant etiological factor for c-SCLC. The malignant tumor is classified and diagnosed as a combined cell lung carcinoma (c-SCLC) if it’s found with at least one (or more than one) differentiated forms of lung cancer. These forms may include adenocarcinoma or squamous cell carcinoma. Currently, SCLC has only one recognised subtype which is c-SCLC. Also, the combined c-SCLC is staged and treated similarly to the proper small-cell carcinoma of lung currently. However, some recent studies and research shows that surgery might improve outcomes in patients suffering with c-SCLC when done in the very early stages. Signs and symptoms of this variant are same as other lung cancers. In rare cases, the primary small-cell carcinoma’s primary site is outside the lungs and pleural space. This condition is called extrapulmonary small-cell carcinoma (EPSCC). It’s usually treated with the same medication used for small-cell lung carcinoma. Small-cell carcinoma of prostate (SCCP) is a rare form of cancer. It’s incidence is nearly 1% among all prostate cancers. There is a little variation in prostate specific antigen levels in this cancer, which results in late diagnosis, usually when the cancer has metastasised and disease has reached in advanced stage. Prostate cancer can metastsize to the brain. If the tumor is confined and contained within one lung and involves the lymph nodes that are in the vacinity of that lung only, it’s considered a limited scale carcinoma. However if the cancer has spread outside the primary lung or region, it’s said to be extensive stage. It’s important to note that the patients receiving the chest radiotherapy for treatment of limited stage SCLC have better survival rate. Surgery has a little role in the treatment of LS-SCLC as the tumour metastasizes widely during the early stages and as the chemotherapy along with or without radiotherapy has a very good response. However, if there is an asymptomatic, small and node-negative SCLC, surgical excision can be performed prior to adjuvant chemotherapy. Along with radiotherapy in order to palliate dyspnea, bone or liver metastasis pain, brain mets, etc. Despite having a good response to platinum containing agents for chemotherapy and radiotherapy, the long term prognosis is not too good as there is a high chance of relapse. Thus the median survival remains low. In Limited stage variation, median survival of the patients after successful treatment is 14-20 months. Nearly 20% of the patients live longer than 5 years. Overall prognosis is poor as nearly only 10-15% patients of small cell lung carcinoma survive more than 3 years. The prognosis goes worse in patients with extensive-stage small-cell lung carcinoma. Their median survival after treatment is 8-13 months while only 1-5% patients make beyond 5 years or more following treatment.